Pain is our body's way of getting our attention, and we should treat it as such. You don't want to mask the symptoms without addressing the cause, or you are likely to cause additional damage and potential chronic pain. Our bodies were designed to heal, we just need to provide the tools to do it. Natural back pain relief can often be achieved at home. Most of use treat our backs very badly, using them in ways that they were not designed to be used. The first step to relieving back pain is to avoid causing it in the first place, if possible. Squat, don't bend – use your knees and legs for lifting, not your back. Since I have switched to more squatting, I have noticed that it stretches out my lower back and I am much less sore after long sessions in the garden. Don't lift and twist – Keep your back straight. 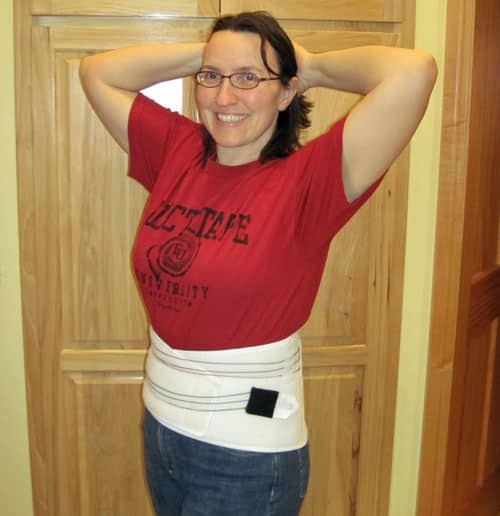 to help train yourself to lift properly and support your back, you may wish to invest in a back support belt, such as those manufacturer at Core Products International Inc. in western Wisconsin. 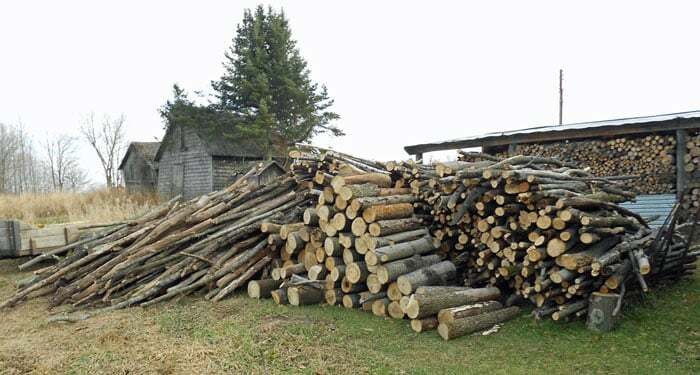 I purchased the one shown in the photo at the top of the post, the Corfit Belt Advantage Belt, and wear it when I am doing heavy or repetitive lifting, such as moving firewood or heavy garden items. (A good friend of mine works at Core Products. If you end up purchasing any of their products, tell them I sent you. Maybe if we generate enough traffic, they'll offer a discount to CSH readers. ;-)) Free Shipping on purchases of $20 or more at Core Products – Enter Code “FREESHIP” at checkout. This video illustrates proper form for sitting and squatting. Natural Back Pain Relief – What should I do if I strain my back? You have severe pain and cannot put any weight on the injured joint. The injured area looks crooked or has lumps and bumps (other than swelling) that you do not see on the uninjured joint. You cannot move the injured joint. You cannot walk more than four steps without significant pain. You have numbness in any part of the injured area. You see redness or red streaks spreading out from the injury. You injure an area that has been injured several times before. You are in doubt about the seriousness of the injury or how to care for it. RICE – Rest, Ice, Compression and Elevation can help to relieve pain ( see more on the NIAMS site). He's a big guy, but the pile of wood was bigger. He was pretty sure he was going to need a visit to the chiropractor, as he had a painful knot of muscle mid-back. He applied the Smart Salve three times within 24 hours of the injury, and the pain and swelling decreased dramatically, to the point where he no longer felt he needed to see a chiropractor. He was so excited by how well it worked he called me up to tell me. Yesterday, I pulled a muscle between my shoulder blades lifting a heavy potted plant. That one was so sore it made me catch my breath. I applied the salve three times yesterday and once this morning, and the pain has faded to just a bit of “ow”. 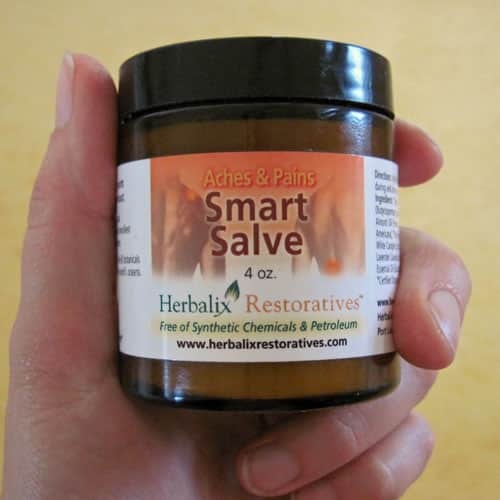 The salve is also good for bruises and hemorrhoids, too – basically any type of surface inflammation. If you have long term back problems, you need to look at underlying causes. Pain is caused by inflammation, so an anti-inflammatory diet may help. Water – Dehydration is a common cause of muscle fatigue. Simple, but true. If you are coping with severe or chronic pain that does not respond to standard self-treatment, please seek professional help. The techniques described in the book “Healing Back Pain: The Mind-Body Connection” by Dr. John Sarno seem to hold potential for helping those with chronic pain. I have not tried these techniques, but a friend has, and said that they were pleased with the initial results. Treatments such as chiropractic adjustments, acupuncture, bowen therapy, massage, prolotherapy and balneotherapy are professional options that may be available in your area. Should You Exercise if You Have Back Pain? Be gentle, start slow, and if you experience intense pain, weakness, numbness or any of the other symptoms listed at the top of the post, please seek professional help, but don't stop moving just because you ache, or the problem will only get worse. This information is for educational purposes only and should not replace any advise from a medical doctor. I hope you will find some of the home remedies my family and I use to be helpful. Things We’re Embarrassed to Talk About – What’s a Healthy Bowel Movement? This was such a timely blog! Hubs and I have been digging rock out of the zinnia bed. Some of them are huge. And yesterday morning I woke with some spasms just below my left shoulder blade. Funny thing was, I went outside to see if I could work any at all, and nothing hurt at all, all the time I was out there. This was a blessing because I really want to get finished with this project before bad weather starts being an everyday thing. Then came in, and noticed the sharp stabs again. I’m some better this morning. It’s a funny thing, isn’t it, how using the affected muscle is the best thing for working out the soreness? It would seem like just the opposite should be true. Our bodies are engineering marvels. Ilene – good for you that you got back at it. It makes me so sad when I think of the number of people I know who put off being active because of moderate aches and pains, when the best thing for them would be to keep moving. I know I feel a HUGE difference between when I am active and when I am not. I’d like to suggest that therapeutic massage, provided by a Licensed Massage Therapist, is an excellent treatment for many types of back pain, both acute and chronic. A good therapist will conduct a thorough interview and assessment before explaining treatment options. Sometimes it’s appropriate for the therapist to request either a clearance to receive massage or a prescription for it from the treating physician to ensure that the client is healthy enough to receive deep work. A caution, though; many physicians have never learned much about massage, and may be unaware of the benefits it offers, such as overall reduction in perception of pain, reduced need for prescription and over the counter medications, and increased range of motion and muscle pliability. While many excellent therapist work at spas, look for an independent therapist who specializes in injury recovery and/or orthopedic massage. Wow, what a great article! You’re very right about dangerous back pain exercises – Some of them do more harm than good and can actually make the problem worse! I have back pain as I understand due to Fibromyalgia. I Also suffer from Chronic Fatigue syndrome. Also suffer greatly from trauma. I have gone to the doctors and nothing helps yet. It’s been years… I’m trying to look to alternative treatments. So any treatments with hard and fast results welcome,and I’ll give it a try. Also I don’t drive and live in Wales U.K. and can’t afford any very expensive treatments . Thanks.